Fall and winter salads differ from their light and cooling summer cousin. Cold weather salads should be filling and comforting, hardy with fruit and nuts, cheese and dried meat. While served fresh, these salads should give warmth in substance. 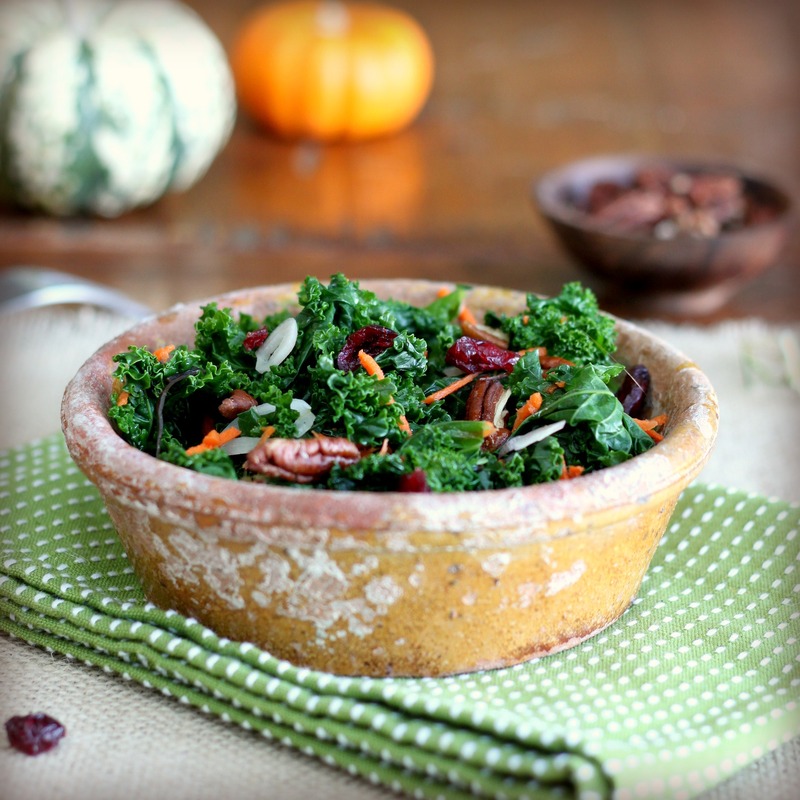 The base of this bright fall salad is kale. In it’s raw form kale is tough and bitter, best shredded in a slaw or sautéed in olive oil. For this salad I’ve softened the kale by quickly blanching it just to soften its edges without wilting. The other ingredients fall willingly into formation, adding sweetness, crunch and a vibrancy of color pretty enough to decorate any holiday table. Sliced persimmons would also be a nice addition to this salad. Make the vinaigrette: Whisk the vinegar, lemon juice, salt and pepper together in a small bowl. Slowly add the olive oil in a steady stream, whisking constantly to emulsify. Set aside. Bring a large pot of salted water to a rolling boil. Add kale and blanch just until the color brightens and the leaves still hold their shape, 20 seconds. Drain immediately and rinse under cold water. Spin dry in a salad spinner or blot dry with a kitchen towel. Transfer to a bowl. Add remaining ingredients. Toss with half of the dressing and taste for seasoning. Serve with additional dressing to taste. A beautifully healthy and delicious looking salad! Interesting combination. You always have such beautiful photography and kitchenware to compliment your amazing recipes 🙂 this salad looks so good, even to have in Aussie’s summery Spring! I love how you talk about food, Lynda. And I love this salad! Love the idea of the quick blanching here to just soften the greens without leaching out too much of the kale’s goodness. Can’t wait to try kale in this salad! I love this salad! And totally agree about the difference between summer and winter salads. Gorgeous. I’ve been on holidays, sorry I haven’t commented.i love kale, it’s so nutritious and gorgeous in colour, the ingredients sound refreshing and delicious. Love cranberries and pecans. The vinaigrette looks perfect for this salad, and I love the photo! !